The Australian Kookaburra Silver Bullion Coin has appeared annually from the Perth Mint of Australia since 1990 and has garnered a loyal following of collectors and investors in that twenty-plus year period. 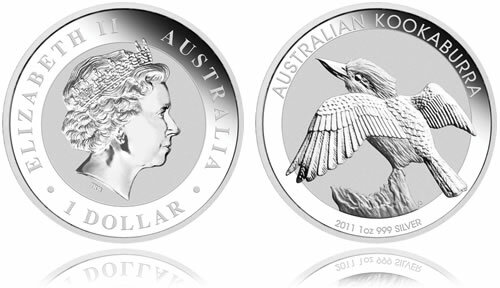 The 2013 Australian Kookaburra Silver Bullion Coin was released on September 3, 2012. Not only do individuals seek the coins for their 99.9% pure silver content, but also because the Perth Mint changes the reverse design on an annual basis. Each reverse is based on the Kookaburra bird, native to Australia and nearby New Guinea. The birds are classified as terrestrial kingfishers and are probably best known for their unmistakable call described as echoing human laughter. 2011 Kookaburra Silver Coin – shows the Australian native bird with its wings spread about to take flight. 2012 Kookaburra Silver Coin – shows the bird with its head looking to the left. 2013 Kookaburra Silver Coin – shows two young kookaburras sitting on a tree branch above flowering foliage. The Perth Mint produces each Kookaburra silver bullion coin as legal tender under the Australian Currency Act of 1965. The 1kg coin has a face value of $30, the 10 ounce strike is $10, the 2 ounce coin has a face value of $2 and the ounce is $1. Literally hundreds of thousands of these coins have been sold by the Perth Mint since first introduced. However, the most popular by far is the one ounce Kookaburra. The smallest of the Kookaburras has had an annual mintage in place of 300,000 since first introduced, whereas the larger strikes have no mintage cap in place. *These figures were last updated by the Mint on April 13, 2012.